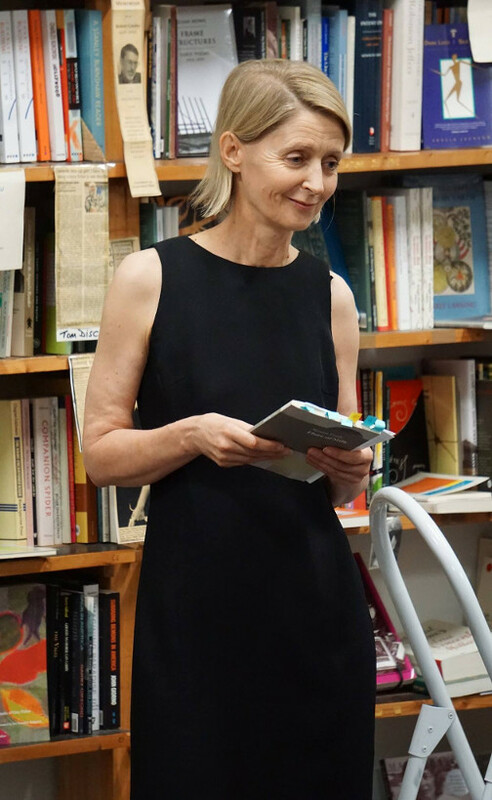 Flute of Milk by Susan Fealy, UWAP 2017, was launched by Alex Skovron at Collected Works Bookshop on 16 March 2017. Susan Fealy at the launch of Flute of Milk. Photo by Richard Mudford. It was near enough to a decade ago that one Susan Fealy materialized on the Melbourne literary scene as if out of nowhere – or so it seems in retrospect, and so it appeared to me at the time. She had written a searching response to my then recently published novella, The Poet, and this led to an exchange of emails and our first meeting. We began to cross paths at poetry readings, and I soon discovered that Susan loved to write long but interesting emails packed with her musings and reflections on matters literary, artistic, or otherwise noteworthy. As time went on, these emails, and our conversations whenever we met up, gradually revealed to me a person who thought hard about language, art, ideas, the natural world; a serious, passionate reader who probed deeply into whatever text was before her or whatever notion was exercising her mind. These characteristics are richly mirrored in Susan Fealy’s poetry. I believe that Flute of Milk is a very strong first collection. It has certainly been a while coming, and this has worked much to its advantage. Because Susan has been patient and unrushed, fine-tuning her work with meticulous care at every opportunity. The result is the volume we’re launching here today: an accomplished and impressive book of poems. Where to begin? Let me venture to say, first of all, that close observation is one hallmark of this collection, and that (if I may put it this way) the author’s poetic lens is focused on discerning the molecules of experience as mediated by memory, intellect, and an acute aesthetic sensibility. Memory, in one guise or another, is a driving force in many of the poems – the fulcrum on which the innocence of seeing, and the experience of being and feeling, are balanced. With this all-important image suddenly illuminated and transformed, the poem pauses to ‘hold still’ for a moment one such precious memory, before flowing forward and into its beautifully rendered conclusion – which I must let you discover for yourselves. From there, the book just builds in authority as we read. ……………………………………………in a Sisley or Corot. …………………………………………………and still I can sing away the spring. At 5 pm your wings will hang with shadow. tapping at the window, frantic as a tiny bell? Or is your soul composed—a forest of shadows? like stars and your pelt is stopped as a tinderbox. but is more a piano. The spark for the book’s opening poem, ‘Made in Delft’ , can be traced to the gleam of oil on canvas. A prelude to the title-poem that follows next, it offers a vibrant ekphrastic response to The Milkmaid by Johannes Vermeer. Elsewhere, the porcelain bowls admired by the poet in ‘Southern Ice Porcelain’ strike her as ‘so perfect they must exist / in an alphabet of shape’, as they ‘wait / for the company of angels’ . While on ‘The Wabi-sabi Storage Jar’, the subject of the facing poem, ‘Night kisses a mountain’ . Earlier, in ‘Seeing the Pregnant Woman at Pompeii’ , nature’s deadly, unwitting artistry also makes an appearance – it’s a poem whose heart-rending empathy reaches back across twenty centuries. 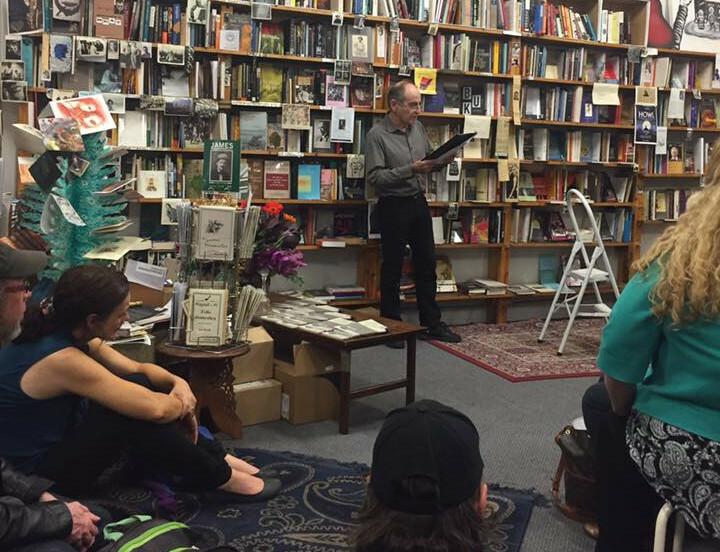 Alex Skovron launching Susan Fealy’s Flute of Milk. Photo by Jennifer McKenzie. as if you swallowed a morning star. close your eyes, remember how she was. pours out its clear blue. Technical skill, craftsmanship and a steadfast concern for language are evident throughout this versatile collection – language that can startle and delight without trying to be showy. Susan is prepared to experiment with line, layout, punctuation and form, to construct a range of vehicles for the shifting rhythms, modes and melodies that animate her poetry: we are offered couplets and quatrains, sonnets and free verse, prose-poems, epigrammatic miniatures, linked sequences – and a villanelle, ‘Metamorphosis’ , where she riffs on crows and jackdaws, cathedral-birds and Kafka, with a dose of Czech etymology thrown in! Kafka is far from alone – despite (if I may digress) what all the mythmakers would have us believe about him! Anyway, a variety of familiar names make cameo appearances throughout Flute of Milk, scattered among the poems and epigraphs, or unmasked in the endnotes at the back of the book. We catch glimpses of Adamson and Albiston, Banville and Baudelaire, Chagall, Dickinson and Glück (that’s Louise not Christoph Willibald), not to mention MacLeish, Matisse and Whiteley. This poet is ever-receptive to the inspiration of other writers and artists. To sum up, then, with a somewhat broader brush: I think that at the heart of Susan Fealy’s poetic there dwells a passionate capacity, a need, to observe, to penetrate – to weigh on the scales of language – the sights and sensations, the thoughts and feelings, that colour our days and can reaffirm or reset who we are. A keen, imaginative questioning hovers about these pages: an interrogative disposition that is often implicit rather than expressed (implicit, although phrases introduced with ‘why’, ‘what’, ‘how’ or ‘how to’ occur perhaps twenty times across the poems). Now and then, this coincides with a deceptively offhanded tone, or a rhetorical elision, where the poetic moment is magnetized by a refusal not to clip the syntax. Susan’s voice can be sprightly but composed, patient but pressing, inquisitive, earnest, affectionate. And under her original gaze, what is apprehended can risk becoming something stranger and richer. Susan is known and appreciated, by those of us who are acquainted with her, as a loyal, compassionate friend, and as a stalwart and active member of the Melbourne poetry community. She has attended innumerable Collected Works and other poetry events over the years, supporting her fellow-writers and celebrating their achievements. Well, tonight it’s her turn – and our turn to celebrate her achievement. So please raise your flutes of milk, or whatever else they contain, and let’s drink a toast to Susan, so that I can declare this remarkable vessel officially launched. & Selected Poems (2014), was shortlisted in the Prime Minister’s Literary Awards. A collection of short stories, The Man who Took to his Bed, is forthcoming from Puncher & Wattmann. Flute of Milk is available for review. Please go to the Book Notes page for details.